Private companies are illegally occupying land in Papua New Guinea for logging and palm oil plantations, according to a new report published by War on Want and its partner in Papua New Guinea, Act NOW!. 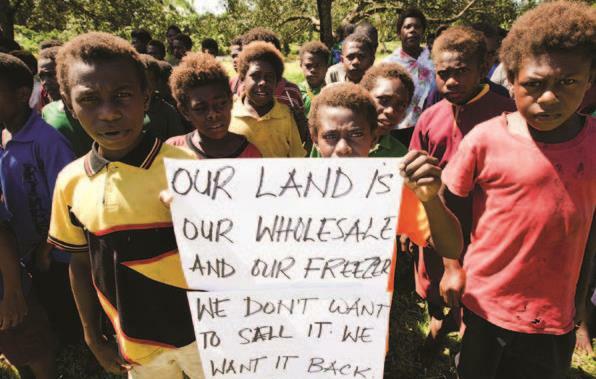 The report, The SABL land grab: Papua New Guinea’s ongoing human rights scandal, reveals the devastating impact of corporate land grabs on the indigenous population. Foreign companies are exploiting Special Agricultural Business Leases (SABL), without due process, to illegally lease land from indigenous customary landowners. The land and its inhabitants are then exploited for profit, the rich natural resources exported to countries like China, and the indigenous peoples forced to work on their own land for poverty wages. So far, SABLs have been used to transfer control of over five million hectares of land, primarily to Malaysian logging and palm oil companies. “The ongoing land grabs in this former British colony are a grave injustice. Our report shines a spotlight on the brave resistance of communities defending their lands and fighting for their rights. But the situation demands action, not only by the PNG government, but also by various United Nations bodies and other national governments. As a result of the land grab, thousands of people, most living in remote rural communities, have seen their traditional subsistence livelihoods and environments destroyed. The report demonstrates that the indigenous population has suffered a wide-range of serious and ongoing human rights abuses since SABLs were introduced in 2007. Logging and palm oil companies have forced agreements out of customary land owners through intimidation and bribing corrupt officials, ignoring due process to obtain the leases for the maximum term of 99 years. When land defenders resist, they face further violence. For further information or interviews, contact War on Want’s media department on 0207 324 5065 or media@waronwant.org.